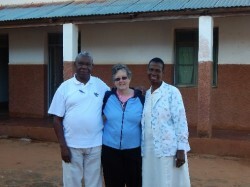 Slowly the day drew nearer and nearer to when we were departing for Mozambique. Months of communication and planning had all finally paid off and the team from Hope and Healing Africa landed in Johannesburg on the 19th June. The day after was meant to be the day we travelled, but was changed because there was equipment that needed to be bought and prices to be checked against the local Mozambique prices. So on the 21st June we set off for Xai Xai, our stop over. The mood in the car was one of excitement and expectancy, but at the same time, jetlag and the effects of the long trip to South Africa took over. The border crossing into Mozambique was quiet and was not a major stress to get through. It took us about 45 minutes and this included the America team members getting visas. The next day we did the shorter, 5 hour journey up to Nhaloi, which is about 30km past Massinga. We arrived at the hospital to be greeted by Alfredo Sevene, the head nurse of the hospital and his wife Julieta. This welcome can best be described as a welcome home greeting. There was such joy and celebration because we had arrived. The trip’s major focus was medical, as the team consisted of a doctor, Randy and 3 nurses Jim, Judy and Peter, each having their own set of skills and passions. Randy ran a clinic daily for 3 weeks. We saw on average 20-25 patients. 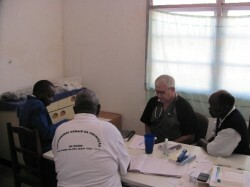 Peter often assisted Randy in doing the hands on stuff, so that Randy could see another patient. 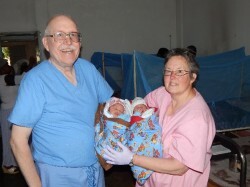 Judy and Jim were often found in the maternity section, where they delivered 15 babies in the short time we were there, the final 2 being twins. There were 3 other key focuses that turned into 4 while on the trip. The first was to install solar suitcases in the delivery room, as the midwives were delivering babies with paraffin lamps. This system contains solar panels, charging regulator, battery and 2 led lights. They were a real blessing in the darkness. The second was to collect the medication, that was ordered and to hand it over to the clinic- these were a real blessing to the people who, for some, have suffered for so long, untreated. The third key project was to try get the John Deer generator to run. It was always an urban myth on when it last ran and powered the buildings. After replacing many hoses, bypassing a filter and lots of head scratching we finally got it to turn over and power the buildings. The fourth project was to get water out of the well that had been drilled the previous year. Everybody thought that the people had a way of getting water out of the borehole, but to our surprise it was just a blue pipe sticking out of the ground. Unfortunately, this project was not completed due to faulty pumps, no stock of hand pumps and the little generator not providing enough power for the new pump. 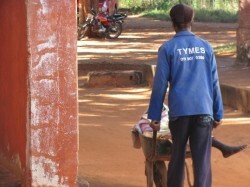 The memory that will stay in my mind is that of an older lady brought to see the doctor in a wheel barrow. She was unable to walk and was too weak to even stand. This was a real reminder of how privileged I am and the things that I take for granted. After 28 days in Nhaloi we said our goodbyes at the hospital. This was hard because in the few short days that we were there, they had become family. We headed down to Xai Xai again and the next day we travelled back into South Africa where we had some well-deserved R&R in the Kruger National Park. The trip was one that I will not forget and one that opened my eyes again to the endless possibilities that are available to serve God on His mission. To end I’d like to challenge you: What skills and abilities do you have to serve God and make His name famous?